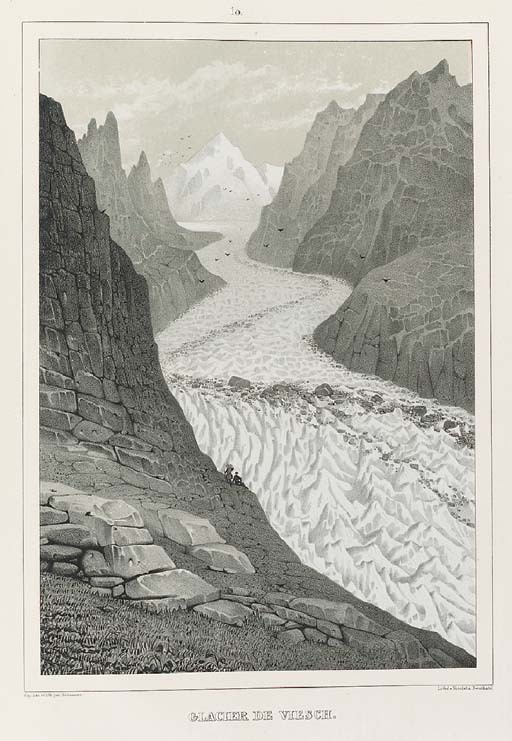 [Études sur les Glaciers Neuchatel: for the author, 1840]. Atlas volume only (lacking 8° text volume), 2° (454 x 295mm). 18 lithographic plates by Joseph Battanier, printed by Nicolet, 17 tinted views, 14 of these with the facing thin-paper guards printed with captioned lithographic outline key-plates, one plate of geological specimens. (Key-plate to plate 1 somewhat creased, partially detached and with small tear to inner margin, key-plate to plate 9 loosely inserted.) Neatly rebound to style in modern brown half morocco with contemporary patterned-cloth covers, spine gilt with red morocco lettering-piece, original upper wrapper with lithographed calligraphic title and integral vignette bound in as title. A fine copy of the atlas volume of this important work, marking 'the beginning of modern glacial geology' (PMM). The atlas volume 'is illustrated with outstanding tinted lithographs. Through the use of tissue overlays printed with outlines of the glacial formations identified by letter and number keys, Agassiz is able to avoid placing identifying symbols directly on the landscape views' (Norman). Agassiz 'was innovative in the wide-ranging character of his research, his measurements of ice formations, and his elaboration of local geology into a theory explaining Continental natural history' (DSB). Cf.Horblit 1; cf.Norman 17; cf.PMM 309; cf.Ward & Carozzi 12.